Balancer chromosomes are an essential and powerful part of a fly geneticist's toolbox. They are used to maintain deleterious mutations in stable stocks as well as to prevent recombination and follow chromosomes in genetic mating schemes. Balancer chromosomes keep homozygous lethal or sterile mutations from being lost from a population and they prevent multiple alleles on the same chromosome from being separated by meiotic recombination. All balancers have two essential features - recessive deleterious mutations and inversion breakpoints. A recessive lethal or sterile mutation in one gene can be maintained in a population if it is combined with a recessive lethal or sterile mutation in another gene on the homologous chromosome (see figure). This arrangement of mutations is called a “balanced system” and it’s where the term “balancer” comes from. 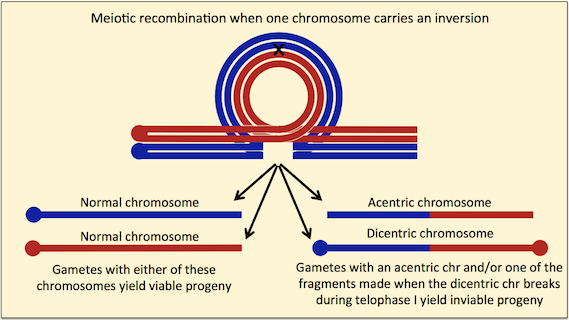 A balanced system will persist only if no meiotic recombination occurs between the deleterious mutations to generate chromosomes lacking mutations. Chromosomal inversions prevent the recovery of recombinant chromosomes in two ways. First, crossovers do not form in the vicinity of inversion breakpoints, because synapsis is inhibited. Second, single crossovers inside inversions lead to aneuploid gametes that cannot give rise to normal progeny (see figure). Many balancers carry other genetic elements to make them more useful—even though these features are not necessary for maintaining mutations in populations. Dominant visible mutations allow you to tell which progeny inherit the balancer in crosses (see figure). Many mutations with dominant visible phenotypes are also recessive lethal, so they contribute to the balanced system (Sb on some TM3 balancers is a good example). Many balancers carry recessive visible mutations that can be quite useful in crosses. The figure shows an example of saving a generation of crosses using recessive visible markers on a balancer marked with cn and bw mutations. Some balancers carry transgenes that make the balancers easier to follow in crosses (e.g. transgene insertions that express GFP) or that can be used in specific experiments (e.g. transgenes that express P transposase or GAL80). Each balancer chromosome carried a particular set of dominant and recessive mutations when it was first isolated. We call this original combination of inversions and marker mutations the “core balancer”. Subsequently, new versions were often isolated with additional marker mutations or transgenes. In Bloomington genotypes, we do not list the genetic markers associated with core balancers. We assume you know they’re present. We list only the variant markers or transgenes. For example, all CyO balancers carry the Cy, dp[lvI], pr and cn mutations, so they are never written out in genotypes. We do this to keep genotypes from getting too long and cumbersome. This is the most common mistake people make in choosing balancers. For example, CyO is probably the most popular second chromosome balancer, but it does a poor job maintaining mutations near the chromosome ends, because its distal most breakpoints are in 22D and 58B. Recombination distal to these breakpoints is reduced, but crossovers still occur. Other second chromosome balancers with breakpoints closer to the telomeres work better. If a mutation is located in the middle of a large inverted segment, double crossovers within the segment may lead to its loss. For instance, a mutation in eyg at 69C2 is likely better balanced by TM1 (with a breakpoint at 69E) or TM3 (with a breakpoint at 71C) than by TM2 which has no inversion breakpoints between 61C and 74. The frequency of recombination has not been measured within most balancer segments, so it is often difficult to judge if a segment is “too big”. In general, recombination is fairly well suppressed across the internal segments of most multiply inverted balancers, so double crossovers in the middle of chromosomes are less of a concern than crossovers near the ends. Nevertheless, it is prudent to check balancer breakpoints and to be aware that recombination can increase under some circumstances (see The danger of multiple balancers below). Sometimes, your only choice will be to use a balancer with breakpoints that are not optimal. In situations like this, you should maintain duplicate stocks in case one copy breaks down from unwanted recombination. Keep in mind that simple chromosomal aberrations can be quite effective balancers if mutations are located near breakpoints. Single inversions are used as balancers in many Bloomington stocks. Reciprocal and insertional translocation chromosomes can also be effective in maintaining mutations in populations, even though they are not commonly used for this purpose and no one calls them “balancers”. If meiotic recombination is prevented in one region of the genome, the cell reacts by increasing recombination in other regions. This is called the “interchromosomal effect”. If multiple balancers are present, recombination will often occur in regions where it is uncommon when a single balancer is present. Recombination distal to the distalmost balancer breakpoints and recombination within inverted segments is increased, so stock breakdown is more common. The interchromosomal effect explains why it is a poor strategy to combine multiple balancers if you are trying to extract whole chromosomes from natural populations, isogenize whole chromosomes or substitute whole chromosomes into stocks. You will almost always end up with chromosomes carrying segments from the balancers. Chapter 13 of Drosophila: a laboratory handbook discusses strategies for minimizing impacts of the interchromosomal effect.